Are your parents 65 and older and like to enjoy a glass of wine (or two) from time-to-time? Have you noticed that things have changed a little for them after a few drinks compared to earlier days? Perhaps their hands shake a little more than you noticed in the past, their balance is more easily affected or you might find them not thinking as clearly. What is going on and what has brought on this change? The truth is that when we arrive at our mid to late 60’s, the effects of alcohol are much more significant (and damaging) on us than it did when we were younger. As with all stages of life, our bodies are changing and we are just not able to process alcohol as easily as we once could. The same amount of alcohol that was fine when your parents were 50 is too much for them now. Why this is happening, and what are the risks that are involved if we have too much to drink? Prescription medicines and alcohol rarely mix. As we age, we may have to take prescribed drugs to treat chronic ailments. Mixing the two together can cause nausea, drowsiness and reduced motor skills (to name a few). More than 150 medications commonly prescribed to seniors can result in problems if consumed with alcohol; some may not work as they are meant to, while others may have an increased or dangerous effect. The part of our brain called the cerebellum changes as we age. This is the part of the brain that helps us regulate coordination, posture and balance. Alcohol degenerates the cerebellum, causing problems with coordination and balance. Our livers produce enzymes that help to metabolize (break down) alcohol in our body. As we get older, our liver produces fewer of these enzymes which makes us even more susceptible to the effects of alcohol. As a result, alcohol takes longer to process as we age. The ratio of body fat to body water is an important factor for blood-alcohol concentration. If you are 65 and older you may have noticed that you have a reduced ratio of fat to water which serves to increase the blood-alcohol concentration. Reduced balance and coordination causing a greater risk of falling, with the likelihood of broken bones and a much impaired quality of life. Because the body cells that are damaged by alcohol are less able to regenerate, there is likely to be harm to internal organs including heart, liver and kidneys. Drink-related loss of brain tissue, and shrinkage of the brain’s frontal lobes, can cause memory loss and intellectual impairment. Medical conditions prevalent in old age, like high blood pressure, ulcers, diabetes and depression, are made worse by drinking alcohol. Based on what we have learned, perhaps older adults should avoid drinking altogether or at the least drastically reduce their intake. Unfortunately, there are many reasons why seniors may feel the need to drink more, rather than less, alcohol. Seniors are more likely to experience bereavement, bringing about feelings of grief and loss, and alcohol can be a form of escape from that sadness. There are those who live alone, are retired and might experience boredom or loneliness, for which a drink is seen as an antidote. Finally, there are many stresses in old age, such as being diagnosed with a serious illness, worrying about money, or having a spouse in the hospital, and alcohol can be used as a coping mechanism. Those faced with large amounts of free time after retirement may also turn to alcohol to help pass the time. In spite of these reasons, seniors may be unwilling to reduce their drinking, or may be unable to do so even if they wanted to. In addition, relatives, friends and health care workers may be completely unaware of the problem, as seniors often conceal the amount of drinking they do. The proportion of seniors with alcohol consumption problems is the same as any other adult groups (6% – 10%). Among all age groups, however, health care professionals may have the most difficulty identifying seniors experiencing substance use/abuse issues given that indicators such as memory problems, confusion, lack of self-care, depression, sleep problems and falls may be incorrectly attributed to the effects of aging. If family members or seniors themselves recognize a problem and would like help, there are resources at hand. Alcoholics Anonymous has many resources, and is a good place to begin. For the family members coping with an over-drinking loved one, there is Al Anon. A social worker may help a senior identify what is leading them to drink, and how to either scale it back or eliminate it altogether. 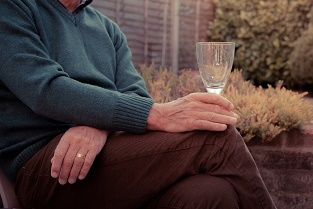 Even in later life, it is perfectly possible to treat alcohol problems successfully. In fact, older people who do enroll in a program tend to respond at least as well as younger people, and are actually more likely to stay the course. The important thing is to acknowledge that there is an issue, and understand the dangers. The resources below will provide more insight into the effects of alcohol on the elderly.